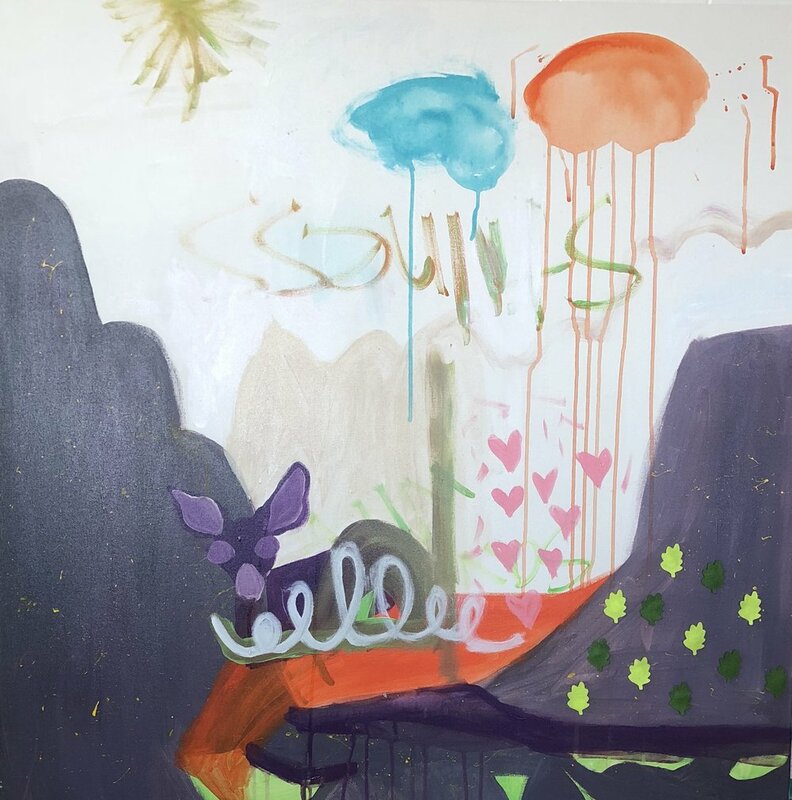 Art & Soul, my solo exhibition that is on display in the GreenSpring Gardens’ Horticulture Center, is a series of large paintings that connect my love for national parks, hiking, and my perception as a dreamer and a mother. It is really important for me to always find a better way to express my voice and I think this year I really did a good job of keeping the series fluid. My favorite painting in this show is called, “Stillness Takes you to Unexpected Places”. The Painting is one of the pieces that I completed earlier this year when I was reviewing my mantra for the year, which is Patience. I am really interested in taking my time, implementing the wisdom of patience, and working on not reacting so quickly. Sometimes, I find that a lot of us are very impatient (especially me) to rush the process. When I was younger, I tended to be indecisive about the way I wanted to live, but once I pulled the trigger on making a decision, I was in a cosmic energetic flow that was abundantly wild and chaotic. I always finished things in an explosion and with a burst. As I was reviewing my year, I noticed that I have almost already kind of understood patience, but I haven’t honored it in my actions. Even though in theory, I understood patience, I was not being like the mountain that I so calmly hike up. So, I thought to myself, how can I best incorporate patience into myself? Then I thought about the mountains I like to hike. Shenandoah in the wintertime is so barren and cold that it’s really magical. The quietness of the hike almost makes you feel like you want to cover yourself up in a blanket and go to bed. I understood why so many bears like to take long naps during the wintertime. But I also in some way grasped patience. Patience to me is like when the air is still enough that it is pausing to take a look around at it’s surroundings. Patience to me is like the still mountain that although, it looks like nothing is happening, deep within it’s belly, there are seeds growing into trees and plants and grass. The love of the mountain and it’s steady pace of stillness allows for new things to grow. It allows for the beauty that is the spring and summer. It allows for all the colors in the wilderness to expand out in brilliance. So what does this piece say about me? It says that I am in the flow with my experience. It says that although, I am a dreamer, wise and experienced in this moment like a mountain; I am also a deer, innocent to my present experience and curious to what will happen. Of course, I may die in this reality (eventually when I am way old) but the beauty of the stillness and patience that I honor is what makes my life so magical. And that is why this painting is my favorite because it says for me, it shows that I have reached a phase of my life where I am no longer changing, but rather building on who I am. Mother, Daughter, Wife, Lover, Hiker, Friend, I am the mountain, the air, the water, the animal, the plants. I exist. And it’s beautiful and filled with love. The show is on display at GreenSpring Gardens until October 28th. All paintings bought will also have part of the money go towards the garden to continue to keep the upkeep of the magical place that I love to walk with my daughter. Let me know if you check it out!